Safety is at the forefront of good course design. Good Disc Golf course design provides a safe course layout that is fun to play whilst providing an appropriate challenge to its target audience. 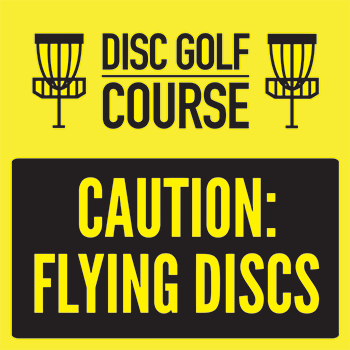 The main safety aspect of any disc golf course is making sure that the general public are not hit by flying discs. This is managed by firstly ensuring that appropriate signage is produced and located effectively to inform people of what Disc Golf is, and warning them that certain areas are designated for disc golf. However, the best safety measure is always the responsibility of players to not throw their discs when people could be hit. As a course develops its regular players they will be able to help younger and less experienced players to follow the simple guidelines and rules used on every course. Educating staff and local people in managing disc golf players and their equipment is also an important part of this process. This is another area where the partnership between Disc Zoo, local players and affected groups can benefit the wider community. All players will have the responsibility of enabling the sport to grow – whatever their ability level. The local disc golf club will have a major role in providing regular events and establishing a membership and this can best be done in partnership with Disc Zoo. By working with the natural terrain, and being sensitive to the people who will be using the land, we can create courses that people love to play, and who will introduce to their friends and family to Disc Golf because they know it is safe.